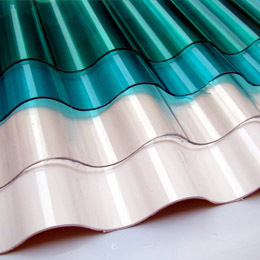 Plastic Roof Panels Best choice for your house! The modern list of roofing materials is extremely rich and continues to be replenished with surprising regularity. As a result, we are able to effectively address the challenges that emerge during the construction. Plastic roofing is a lightweight and durable analog of asbestos shingles that appeared not so long ago and was designed to fix its shortcomings. With the use of the new material, it has become possible to provide better lighting in areas of different building structures, reduce the load on the foundation, accelerate the construction time and much more. Plastic shingles are a sheet or a roll of construction material with predominantly undulating relief used for roofing forms of different complexity and vertical glazing. Their use is rational for buildings of different function. In private domain, they are used in greenhouses, verandas, gazebos, outdoor construction, carports, swimming pools, garden paths, playgrounds. In industrial domain, they are used when building hangars, warehouses, sheds, workshops, in urban planning – commercial pavilions, parking lots, outdoor cafes, stadiums, public transport, visors. For the most part, none of these structures requires installation of roofing insulation materials. Transparent sheets are sometimes used for residential roofing, which does not have exterior walls and hence the natural light sources. There are no specific technical standards for plastic slates and the manufacturers are guided by their own or borrowed technical terms. Therefore, they can be only classified based on samples provided by the construction market. Plastic shingle composition may be homogenous (produced only from polyvinylchloride) or reinforced with polyester and fiberglass. The singles are manufactures either in sheets or rolls and are available in varied sizes (usually 2000 x 900 mm). Strictly speaking, the reinforced varieties are to be called plastic tiles because they are related to layered plastics. Homogenous plastics are mostly monolayer, but some foreign manufacturers include two more layers (for example, the Italian “Eliplast”, “Salux”, the French “Ondex”). Such slates have increased weather and various corrosive environments resistance. It is possible to choose between transparent, translucent and opaque shingles. Therefore, regardless of the light intensity each kind of slates has a perfectly smooth outer side and a rich color palette. These qualities help to reduce the financial expenses: contaminants do not corrode the plastic surface and are easily washed off by rain; the polymer’s dyeability allows the products to maintain the color saturation for the entire life service; the variety of colors frees the imagination, you can combine sheets of different colors and create a mosaic of any complexity with unusual lighting effects in the interior. Durability. The life service of such slates reaches 50 years and is only slightly inferior to the asbestos-cement sheets, but superior to other polymeric roofing materials. Inexpensive plastic slates have the same price as glass sheets. At the same time they are waterproof and resistant to corrosion and abrasion. Light weight combined with high mechanical strength. Resistance to weather conditions and chemicals. Withstands the temperature range from -60 to +75 C (depending on the variety of products, some reinforced sheets do not change their form up until 120). Flexibility, elasticity, the simplicity of processing provides the ability to create roofs of most bizarre forms. Does not sustain the weight of a person, which makes the installation process difficult. Plastic slates, as well as other polymeric materials are capable of expanding when heated and shrink when the temperature decreases. The change of size occurs to a greater extent when compared with the frame, that is why mounting holes are drilled 2-3 mm larger than the diameter of mountings. During the construction of light building structures, plastic sheets are an indispensable modern material that optimally combines efficiency, reliability and health safety.